Presidio of Monterey, Monterey, CA, U.S.A. (2004-present). 1981 Joined in Adachi-Doin (Kuroda Motohisa Sensei, 7th Dan) in Tokyo, Japan. 1985 Transferred to Kawagoe-Doin (Yajima Takao Sensei, 8th Dan) in Saitama, Japan. 1991 Earned "Gon-Chu-Doshi" (Kongo Zen Buddhism Rank). 1993 Assigned the Dojocho (Chief Instructor) of Kawagoe-Doin, Japan. 2005 Established "Defense Language Institute Branch," Monterey, CA, USA. 2007 Changed the name to "Monterey Branch." Moved to Monterey Peninsula Buddhist Temple. 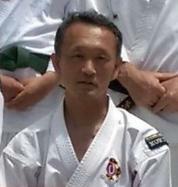 2008 Earned "Jun-Hanshi" (Philosophical Rank). 2017 Earned 7th Degree Blackbelt. Have practiced and taught Shorinji Kempo in Japan & the U.S. for 37 years in total. 1. The Branch Master must be approved and certified to teach Shorinji Kempo by World Shorinji Kempo Organization in Japan. 2. The Branch Master must NOT earn any money for living from teaching Shorinji Kempo. 3. The Branch Master must have a stable full-time job. 4. The Branch Master must contribute not only into Shorinji Kempo, but also into community, society, and the world. 5. The Branch Master must be able to teach not only techniques and philosophy of Shorinji Kempo, but also morals of society and life.